On a cold Saturday afternoon November 19, 1892, Oberlin's Yeomen football team took the field in Ann Arbor against the heavily favored Michigan Wolverines (which had trounced them handily the year before.) Oberlin's new coach, Johann Wilhelm Heisman, brought an undefeated team with him to Ann Arbor. It's not clear what the ‘official’ outcome of the game was. The team captains agreed on a shortened second half, to end at 4:50 pm, so Oberlin could catch the last train home. With less than a minute to go it was Oberlin 24, Michigan 22. As Michigan launched its last drive, the referee (from Oberlin) announced time had expired, and the Oberlin squad left the field to catch the train. 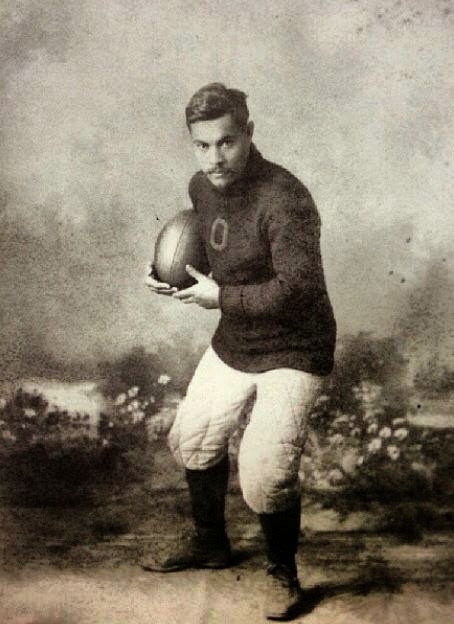 But being the first Hawaiian to play college football is only part of Wise's legacy. When Wise returned home in 1893, the Islands were in turmoil - Queen Liliʻuokalani was overthrown and a Provisional Government had been formed. Wise became a key member of the resistance, helping plan a January 1895 counter-revolution to restore Queen Lili‘uokalani to the throne by force. In December 1918, the association's legislative committee finalized the draft of a "rehabilitation" resolution. Wise (who was serving as Territorial Representative (and later as Senator)) introduced it when the Territorial legislature opened in January 1919 - this set the foundation for the legislative effort to have the Hawaiian Homes Commission Act passed by Congress. By April 25, 1919, the Territorial House of Representatives passed the resolution, and Wise was appointed to a Territorial Legislative Committee responsible for carrying the Territory's legislative package to Congress. In testimony before Congress, Wise stated, "The Hawaiian people are a farming people and fishermen, out-of-door people, and when they were frozen out of their lands and driven into the cities they had to live in the cheapest places, tenements. That is one of the big reasons why the Hawaiian people are dying. Now, the only way to save them, I contend, is to take them back to the lands and give them the mode of living that their ancestors were accustomed to and in that way rehabilitate them." Wise retired from politics in 1925 and took up the quiet life of a farmer on Moloka‘i, where he raised pigs and grew taro. But he soon returned to Honolulu - there, he helped restore Hawaiian language instruction at his alma mater, Kamehameha Schools.